If you’re like me, when you get into the shower in the morning, turn on the hot water, and let the steam fill the room, something happens to your common sense and your vocal chords. Before you can stop to think, your mouth opens and the songs pour out. In my case, badly sung. Professional singers never do this. Before they start singing, they do warm-up exercises. I’ve seen videos of Luciano Pavarotti and even Sting trilling up and down the scale, getting ready for their performance. So it is now with the male Yellow-rumped Warblers that have been at the Fill all winter. They’re busy molting into their breeding plumage, like performers putting on makeup. And they’re practicing their beautiful mating song. The song starts out with a liquid trill that gets louder and faster as it reaches its crescendo. Then the singer takes a breath and gives an encore. And another. It is lovely. But it is only practice for the big performance the males will give in the far north. 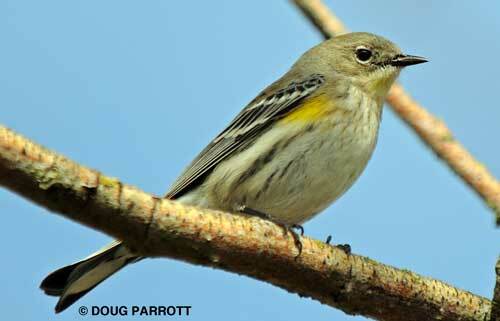 Yellow-rumped Warblers are among the few wood-warblers that regularly stay in our state through the winter. Most of the other species in their large family head much further south – to Mexico, Central America, or South America. Yellow-rumped Warblers, though, are hardy souls who don’t mind eating their insects frozen or soggy. They spend their winters here, dressed in drab plumage and enduring the gray skies that are as drab as they are. Come spring, the males begin to sport lemon-yellow feathers on their heads, flanks, and rumps as they get ready to go on tour in the far north. Their streaky drabness gives way to a symphony of black, gray and white that forms a perfect frame for their splashes of yellow. 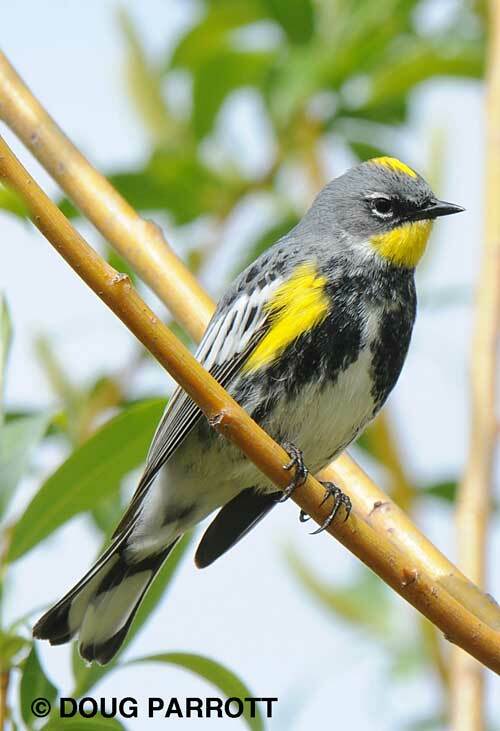 There are two kinds of Yellow-rumped Warblers – in fact, they used to be called two different species: the Myrtle variety has a white throat; the Audubon’s variety has a yellow throat. We get both kinds here at the Fill. You can hear them practicing their songs anywhere there are a few trees or bushes clustered together. My favorite place to listen to their warm-ups, though, is along the west side of University Slough north of the wooden bridge. It’s quiet here, except for the occasional “tink” of golfers hitting balls at the driving range. The perfect spot to hear some truly professional singers at their work. This entry was posted in Uncategorized on April 8, 2010 by constancesidles.